My modified Biolam (Multiscope) was shown previously with the illumination configured for use with high power objectives. I have added low magnification capability using a 1X Rolyn objective, (see footnote), threaded into the end of a drawtube. The working distance is 120 mm for this 60 mm focal length lens. The aperture in the nose extension limits this objective to 0.04 NA at 1X. This objective is used with what John Delly labeled as Köhler-Clarke illumination to illuminate a 11 mm field size in either brightfield or darkfield. The ray diagrams for this illumination are at the bottom of Figure 1 along with the diagram for the 4X and 9X objectives. All three objectives use the same condenser, but with different system configurations. The top element of the 1.25 NA LOMO condenser can be unscrewed to use only the 0.3 NA lower element as the condenser for the 1X, 4X and 9X objectives. I chose to use the separate 0.3 NA lens that comes with the 1.40 NA aplanatic condenser. I mounted it in a threaded tube counterbored at the other end for a LOMO polarizer to which a brass sheet metal handle was added. The 1X objective looks through an open position in the objective lens turret as shown in Figure 2. The full 1/2 inch of the light guide bundle end is needed for darkfield illumination with the darkfield stop inserted into a slot just in front of the aperture diaphragm. The drawtube holder has a rotating dove tail end which mates with the female dove tail in the limb of the microscope. 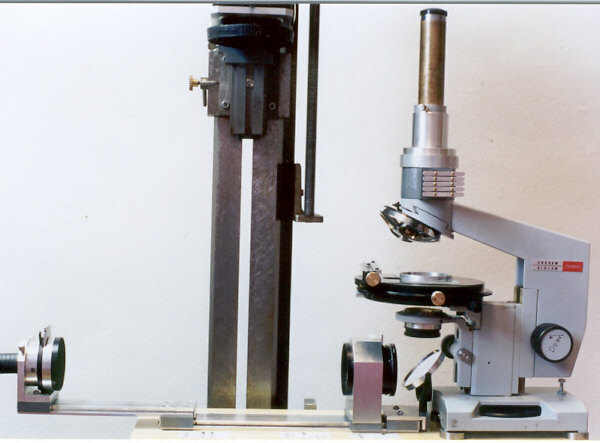 I normally add a housing containing an analyzer and wave plates in sliders between the microscope limb and the drawtube holder as shown in Figure 2. (An epi illuminator can be inserted into this housing after removing the sliders.) These components and the darkfield stop are shown in Figure 3. 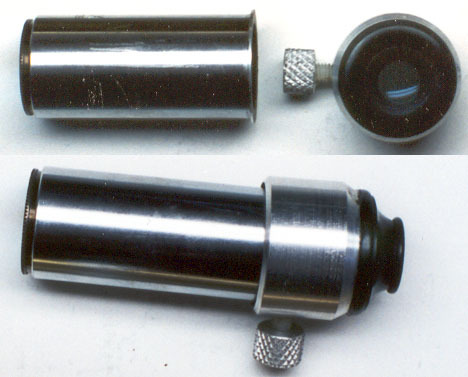 Figure 3: Top: Drawtube with 1X Rolyn objective and modified eyepiece. Center left: Filter tray housing to fit in dovetail on Biolam limb. Center right: Support for drawtube, to fit on filter tray housing. Bottom left: Modified Biolam aplanatic condenser for low power use. A LOMO polarizer is mounted in a pocket at one end. A brass handle added to the polarizer aids insertion and rotation. 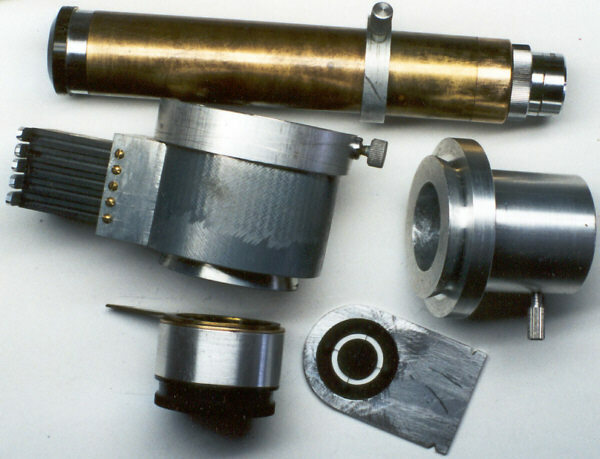 Bottom right: Typical darkfield stop design for fibre optic light guide housing. The LOMO objectives use the Zeiss 160 mm tube length compensating system. So a non-compensating 20X wide-field eyepiece is used for viewing with the 1X objective, which does not use a compensating eyepiece. A photographic projection lens was made from a 5X Huygenian eyepiece by mounting the field lens and eye lens separately. The construction details are shown in Figure 4. The separate eye lens holder is clamped with a nylon tipped thumb screw to the side of the drawtube after the positions of the cap and camera back are found that give a focused image on the film plane covering the illuminated field of the microscope. All comments to the author Comments to the author sent via our contacts page quoting page url plus : ('tclarke','')">Ted Clarke are welcomed. Footnote: The 1X objective is from Rolyn Optics. It is made in Germany. I have the 60 mm focal length lens. This lens is RMS threaded but will not work in a microscope lens turret because of its long working distance of 120 mm at 1X. The author paid $80 for the lens and it should still be available from Rolyn Optics. The design calculations indicated a field size of 12.7 mm but actual measurements showed only 11 mm field diameter. I normally use a 20X widefield eyepiece with this 1X objective because the 0.04 NA allows a 500X NA Abbe criterion with a 20X eyepiece. The full field of the 20X eyepiece is used and the image quality is quite good at 20X viewing magnification. The plane polarized darkfield illumination capability also permits optical dispersion staining of samples in the appropriate mounting media.